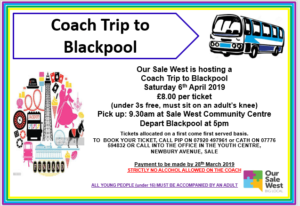 We will be leaving the Community Centre at around 09.30 and from Blackpool at around 17.00. Tickets are £8 each – under 3s are free if sitting on an adult’s knee. Contact Pip on 07920 497961 or Cath on 07776 594832. You can pop in to the office in the Youth Centre to book and pay for your places.